Here you can read about the unboxing of Leagoo Shark 5000 Power Sharing Smartphone. 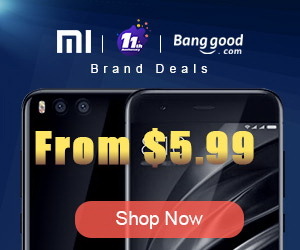 Available features: Dual SIM, Radio FM, WiFi, WiFi Hotspot, Bluetooth 4.0, A-GPS, GPS, Microphone, Front & Back Camera, Camera Flash, USB Host, OTA Sync, Leagoo Beauty app, PowerSaver app, Scheduled Power On & Off, Printing, Leagoo App Store, Voice Search, Sound Recorder, Calculator, MiraVision, Turbo download, FlashLight, Airplane Mode, App Widgets, Audio Output, USB Accessory, Multitouch, HotKnot, Smart Wake, Mobile Anti-theft, LED Notification Light, Smart App Lock, Boost, Google Play Store & gapps, Adaptive brightness & Audio Enhancement (BesAudEnh, BesLoudness & BesSurround). Sensors available on device: 6 sensors on boad: Battery, GPS, WiFi, Accelerometer, Proximity & Light. Cameras. Main camera: 13MP + 8MP rear cameras.Enjoy Capturing! Shark 500 has a 13 MP main rear camera and 8MP selfie camera. Both cameras capture great high resolution images, featuring extraordinary clarity and vivid natural colors. Enjoy the fun of shooting and selfies. Capture modes: Normal & Face Beauty. Display. Diagonal: 5.5". Type: LCD IPS. Resolution: HD 720 x 1280. Density: Medium, 267 Pixels per inch. Others: Capacitive, Multi-touch, Viewing angle - 178°.. Featuring a 5.5-inch large display using IPS display technology, Shark 5000 has a much wider 178-degree viewing angle. Along with the 267 PPI display, which is appropriate for human eyes discerning granular detail, Shark 5000 allows you to see a vivid world through the 5.5-inch IPS display. Battery. Capacity: 5.000mAh with 5V/2A Quick Charg. Type: Removable Li-ion. With 5V / 2A Quick Charge technology and LQC v2.0 Power Management System, the Shark 5000 improves a lot in charge efficiency. The battery is removable and easily replaceable. Internal storage. Capacity: 8 GB. Internal Storage without OS: 4.31 GB. Available: 3.50 GB (81%). SD slot up to 128 GB. Tested with Mixza Tohaoll 128GB SDXC Micro SD Memory Card. 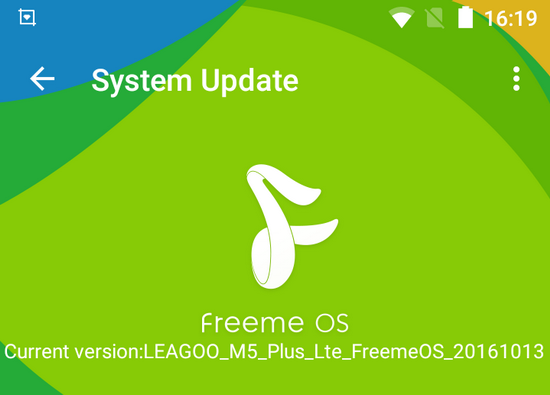 Freeme OS. 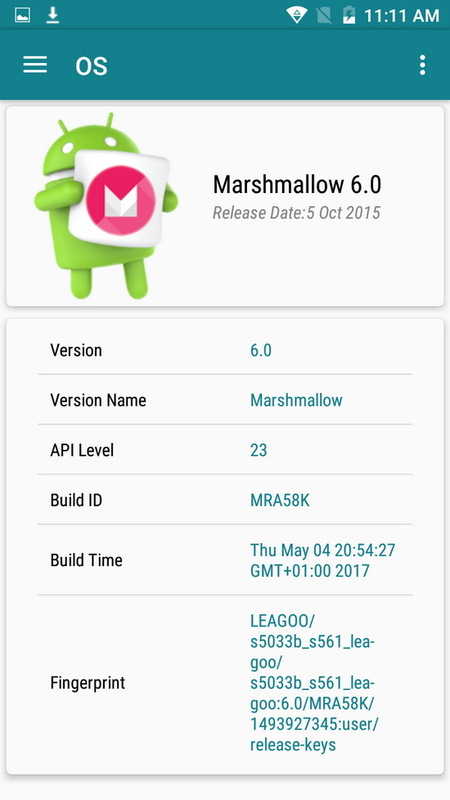 Freeme OS is based on Android Marsmallow 6.0 to create an intelligent operating system, into the "human intelligence technology" concept, more than 3,000 features optimized the upgrade for the user experience to bring "quality" a comprehensive leap. Involving beauty, social, audio and video entertainment, smart address book, WeChat dual account social privacy, information reading, intelligent operation and other life and work scenes required, rich content services, but also allow users to enjoy the wonderful clouds. Freeme OS believes that only system-level security is the fundamental solution for mobile security, based on this not only safe operation, but also to protect users. More details here. Cost-effective. 7.5 from 10 - pretty good. In Antutu Benchmark 6.2.7 Leagoo Shark 5000 smartphone achieves a decent score, about 24.000 points. In Antutu Video Tester 3.0 Leagoo Shark 5000 smartphone scores about 380 points, a fair score in this test ranking. 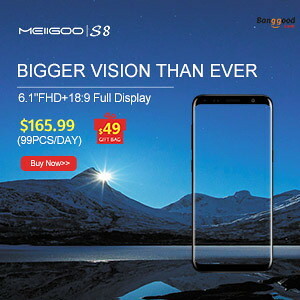 It played smoothly almost all video file types; this firmware version fully supports 11 video & audio format files, it partially supports 8 video & audio format files and doesn’t manage to play 11 files. Wifi Internet speed tested gets also pretty good values: almost 33 Mbps in download and the upload speed was also over 28 Mbps. The router used in this test is Xiaomi Mi WiFi Router, mounted in another room. 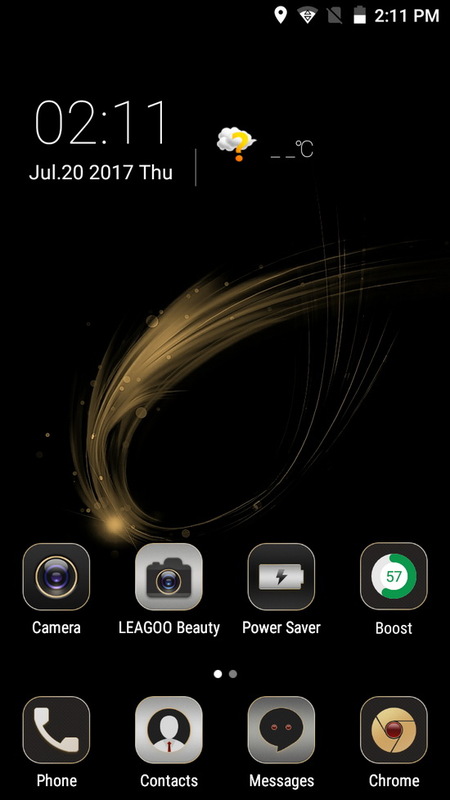 The Freeme OS on the Leagoo Shark 5000 phablet is very smooth, being a very well customized operating system. Transitions, animations, apps switching and general OS fluidity is just great, I really like it a lot. During our tests, we experienced zero force closes, hangups or stability issues. Google Play and gapps are working without issue. Google Play Services updated no problem. 3rd party apps downloaded and updated without issues. Leagoo Shark 5000 Power Sharing Smartphone has an amazing affordable price and very good value for the money. Photo gallery full album here. Official webpage here. 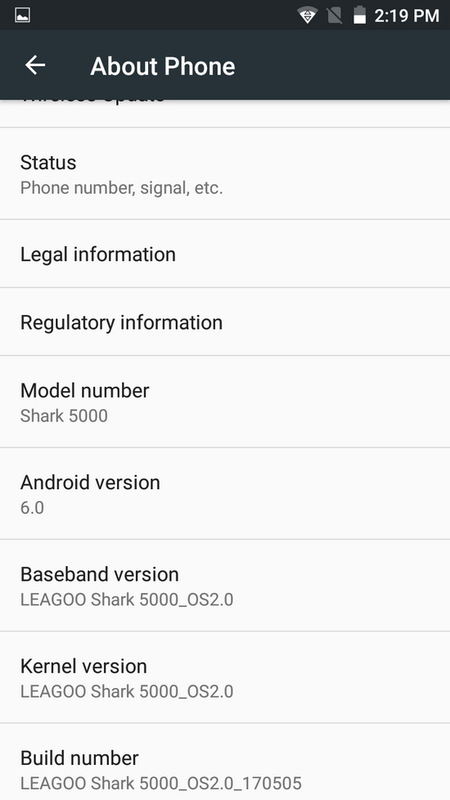 Here you can read about how to easily update firmware via OTA on Leagoo Shark 5000 Power Sharing Smartphone. 4. Leagoo M5 Edge: Unboxing. 5. Leagoo M7: Unboxing & Review. 6. Leagoo M8: Unboxing & Review. 7. Leagoo M8 Pro: Unboxing & Review. 8. Leagoo T1: Unboxing & Review. 9. Leagoo T1 Plus: Unboxing & Review. 10. Leagoo Z1: Unboxing & Review. 11. Leagoo Z5: Unboxing & Review. 12. Leagoo Shark 1: Unboxing & Review. 13. Leagoo Shark 5000: Unboxing & Review. 14. Leagoo Venture 1: Unboxing & Review.